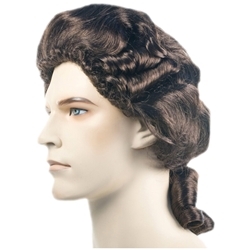 Mid through late 1700's men's wig with two curls on each side and a pigtail in the back. Comes in white, black, brown, auburn (for Jefferson), grey and Amadeus violet. Great for 1776, Our Country's Good, Amadeus, Cinderella, the footmen in My Fair Lady, Mr. Bumble, H.M.S Pinafore, etc.